A man's very public apology for drink-driving has helped to keep him out of prison. 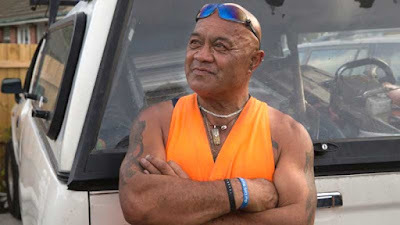 55-year-old Bay Haika appeared in the Christchurch District Court in New Zealand on Tuesday for sentencing having admitted his fourth charge of driving under the influence. Judge John Strettell told him that jail was sometimes imposed for a fourth conviction at a high level. Haika took out a classified ad in The Press newspaper earlier this year to apologise for his drink driving after being caught driving erratically in central Christchurch on December 18, 2015. He had 1013mcg of alcohol to a litre of breath - more than four times the legal limit. Defence counsel Kerry Cook urged the judge to consider the long gap of 19 years since Haika's last conviction, his genuine remorse and his attendance at a treatment programme. Haika had also taken the "extraordinary step" of publicly apologising by publishing a newspaper advertisement. Haika's remorse helped him avoid a jail sentence for his fourth drink-driving conviction. "Most people who come to the courts try to keep their offending as private as possible," Cook said. 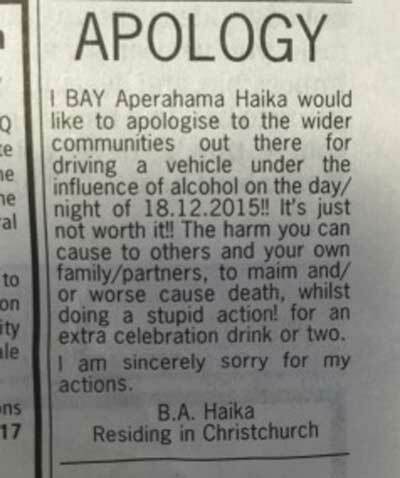 In February, Haika took out a public notice in The Press to say sorry for his actions: "I would like to apologise . . . to the wider communities out there for driving a vehicle under the influence of alcohol," it said. "It's just not worth it!! The harm you can cause to others and your own family/partners, to maim and/or worse cause death, whilst doing a stupid action! for an extra celebration drink or two [sic]." Judge Strettell said to Haika: "You have taken steps to put yourself through a programme and have apologised generally to others through an advertisement in the paper. That is uncommon, I have to say. It does at least recognise a degree of remorse." But he said Haika had been driving with a high breath-alcohol level and it was clear from his erratic driving that he was a danger on the roads and could not properly control his vehicle. He also took into account the long gap since his last conviction. The judge imposed four months of community detention with a nightly curfew at Haika's Linwood address, 150 hours of community work, nine months of intensive supervision with a special condition that he take alcohol and drug intervention as required and disqualified him for driving for a year.